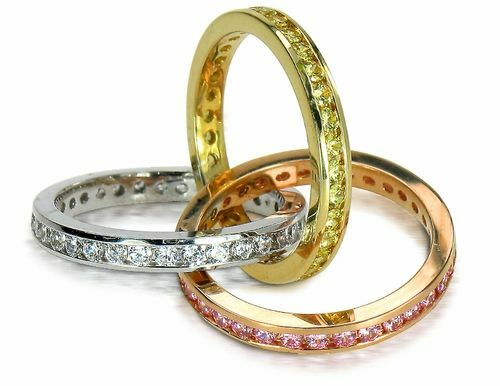 Our Tri Color 14K Gold Channel Set Round Cubic Zirconia Rolling Ring Trinity Ring Russian Wedding Ring Eternity Band Size 8.5 features three rows of slick channel set bands all combined together to bring you one beautiful eternity rolling ring! 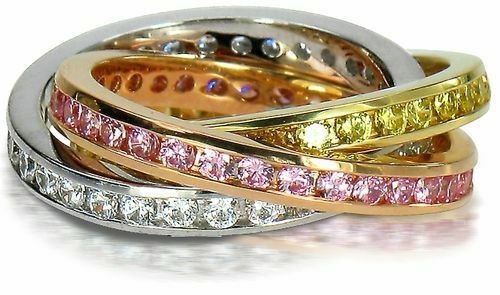 The three interwoven bands include a 14k yellow gold band with canary stones, a 14k rose gold with pink stones and a 14k white gold with white diamond look cubic zirconia stones that are beautifully channel set around each entire band. 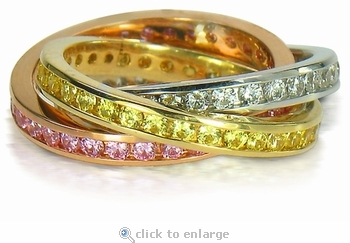 The bands are interwoven and permanently attached to each other to make one united eternity band. When placing the bands on your finger, they automatically slide across each other until they are perfectly in place. This clearance item is offered in a size 8.5. The item is offered on the regular part of our site with additional options, see item R1763. Our Russian formula cubic zirconia is hand cut and hand polished to exact diamond specifications for a spectacular finished product. For further assistance, please contact us directly at 1-866-942-6663 or visit us via live chat and speak with a knowledgeable representative.